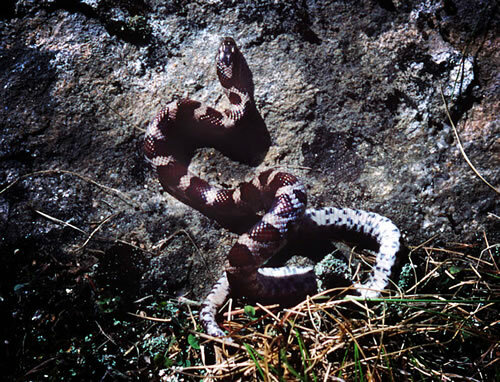 A boldly patterned snake, the milk snake has a light gray to tan body covered with reddish-brown blotches bordered in black. Larger blotches on the back alternate with smaller ones on each side. The head is patterned, usually with a light colored "Y" or "V" within a reddish-brown patch. Smooth scales give this attractive snake a shiny or glossy appearance. The belly is patterned with an irregular checkerboard of black on white. Similarity of patterns causes some to confuse it with the copperhead; however, the copperhead lacks any pattern on the head. 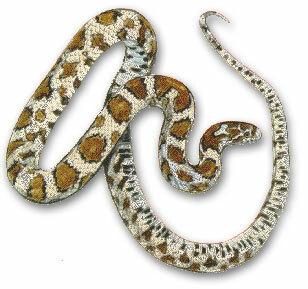 Tail rattling may also lead some to mistake it for a rattlesnake, although the two species look quite different. Mating generally occurs in May, with females depositing 3-24 eggs in June and July. Eggs are deposited under rocks, boards or other debris, in rotting vegetation, stumps or logs, or small mammal burrows, and usually hatch in August and September. 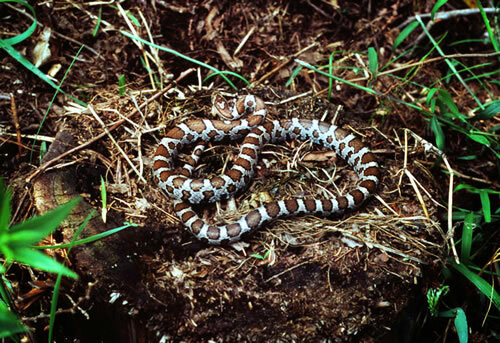 Woodlands, fields, rocky hillsides and borders of wetlands provide natural habitat for milk snakes. They are also commonly found around houses, barns and outbuildings. 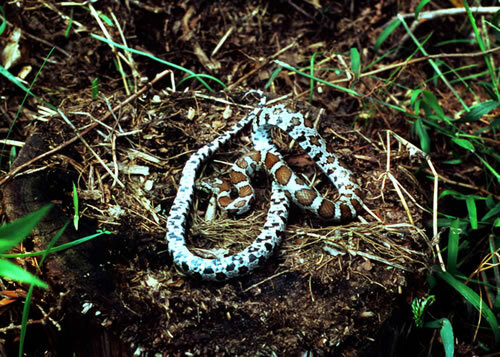 Small mammals are the preferred prey of milk snakes, who are able to enter burrows and consume young in their nests. Milk snakes routinely eat other snakes, and may also take birds and bird eggs, frogs, fish, earthworms, slugs and insects. 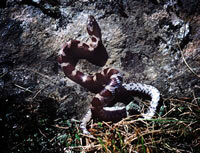 Primarily nocturnal, milk snakes can be found during the day under rocks, logs, or other cover. Although they are not very aggressive, milk snakes will bite and spray musk if handled.